Something strange and disturbing is happening on our west coast. A range of seabird species most folks have never heard of, including traditionally abundant species, are in severe decline. Not all species of local seabirds are affected-but no one knows why, exactly, some have become so depleted in recent decades. What is known is that the species involved, including western grebes, murres, loons, long-tailed ducks, and others, seem to have in common a need for small fish (herring, sand lances, and others who have historically occurred there in vast numbers). Presumably, there are other factors variously involved, depending on the species, but diet seems to be a common factor among them. Meanwhile, the U.S. Army Corps of Engineers is planning to kill off 16,000 double-crested cormorants nesting on islands in the estuary of the mighty Columbia River, on the coast of Oregon, because of a decline in native trout and salmon (both members of the same family, the Salmonidae, thus collectively known as Salmonids). 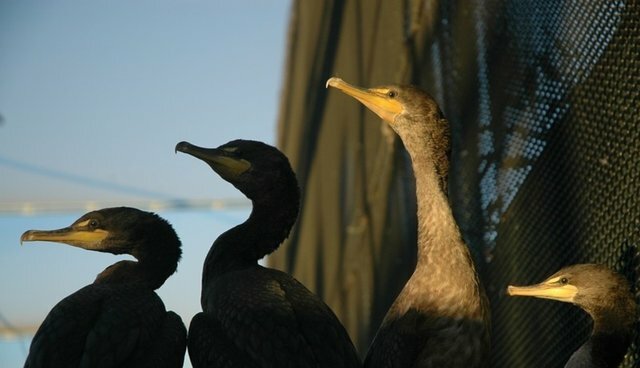 Of course, the wildlife managers have assumed that cormorants are the cause of the decline. They should know better. In nearby Puget Sound, north of the Columbia delta, the production of oyster larvae went from a peak of 7 billion in the 2006–2007 season to less than a third as many by 2009, with similar catastrophic declines in shellfish up and down the coast, and with indications of stunted growth in Alaskan king and tanner crabs. Evidence suggests that the cause is likely increased acidification of the water. Richard A. Feely, a senior scientist of the National Oceanic and Atmospheric Administration's Pacific Marine Environmental Laboratory and the University of Washington, has predicted that, in about 36 years, some 50-70% of the water will be corrosive (see this). And, this will destroy the ability of tiny marine organisms to survive-which, in turn, can deplete the foundation of food chains that end up with Salmonids, as well as whales, seals, cormorants... and us. They can't blame the cormorants for that. On the other hand, this year, the number of sockeye salmon taken from the Columbia River broke all previous records. Why is this Salmonid so abundant, even in the presence of cormorants and with acidification, where others are declining? No one knows. We know that glacier melt has greatly increased recently (contributing to more fresh water, which could decrease sea-water salinity... to the benefit or detriment of marine life that could impact Salmonids)-all of it quite unknown and unprecedented in human history. I recently visited forests in the northern Columbia River drainage basin that consisted of thousands of acres of dead trees. They had died from unprecedented infestations of mountain pine beetles (see this), a species previously kept in check by cold winters (but climate change is apparently changing that). Can that dramatic and relatively sudden ecological change affect Columbia River fish population sizes? No one knows. The Columbia River is about 1,240 miles long; its biggest tributary, the Snake River, 1,078 miles long; and the first part of its system I ever visited, back in the 1960s, the Okanogan River, 115 miles long, with thousands of other tributaries and lake systems feeding into the Columbia Basin. And, what we humans do to every inch of the system can impact on the water's ability to sustain different fish species. Coho and chum salmon are already gone from the Okanogan. We do know that there are about 30 major dams on the Columbia system, some blocking salmon runs. Most Pacific Salmonids must swim upstream from the sea to where they were hatched, in order to lay eggs and complete the cycle that perpetuates the species. We know that they are vulnerable not only to dams and reservoirs, but also from changes in siltation loads, which, in turn, increase in response to forestry and agricultural activities that enhance erosion, augmented by increased numbers of land slides, forest fires, droughts, and floods over recent years. Aquaculture, the penning of vast numbers of Salmonids in coastal waters, has led to concerns about the spread of diseases (see this). A small number of sea lice on wild salmon is normal, but the research indicates that the amount has increased due to the presence of salmon farms that, by creating artificially dense populations of salmon, increase the overall biomass of sea lice (a tiny parasite), to the detriment of wild fish. While a host of human activities are demonstrably damaging to Salmonid survival, including pollution, mega-fish farms, acidification, competitive exotic species, and over-fishing, cormorants and Salmonids have co-existed for millions of years. We know that, in naturally evolved predator-prey relationships, the population size of the prey determines the population size of the predator. We also know that apex predators serve various natural functions in the maintenance of biodiversity (for example, by eating diseased prey and competing species). But, seriously and effectively removing the human cause of Salmonid decline is simply not politically viable. And so, predators are used as scapegoats. There are also a lot of fish-eating Caspian terns in the region, and talk of moving their nesting colony (as unbelievable as that is)-but the terns have the advantage of being attractive and, worldwide, more or less in decline, thus subject to conservation concerns. Sea lions have also been targeted for culling, but people know and love sea lions. Cormorants are relatively little known, and so they are targeted. You could kill every cormorant in the world, and it wouldn't prevent the further loss of Salmonids in the Columbia. But, politically, killing 16,000 creates the illusion that "something is being done" to protect the salmon, without, of course, having to make the hard (but potentially effective) decisions. It is entirely possible that cormorants have a positive impact on Salmonid populations. The managers have no information to make an informed decision, or predict unintended consequences from so much killing.